Prepare the Watermelon Basil juice: Place watermelon and fresh basil in the bowl of a food processor (or blender) and process until very smooth. Strain through fine mesh strainer to remove any solids. Pour water and limeaid concentrate into a small saucepan and sprinkle with the 2 envelopes of gelatin. Allow the gelatin to soak for a minute or two. Heat over very low heat until gelatin is dissolved, stirring constantly, about 5 minutes. Remove from heat. Stir in the vodka or gin and watermelon juice. Add rosewater if desired. Pour mixture into loaf pan or molds. Place in refrigerator to cool, several hours or overnight. To serve, cut into desired shapes (or unmold). Cut shapes out of the watermelon slices with a cookie cutter or a sharp knife. Place one shot on each watermelon shape. Makes 18 to 24 jello shots. The weather has been a bit cool and rainy here in Minneapolis. My fingers are crossed for some sunshine, but in the meantime, I’ll make do daydreaming about patio-friendly cocktails. AND Jelly Shots, like this Watermelon Basil Martini Jelly Shot! What could be better on a warm sunny afternoon than a little cube of watermelon and basil scented heaven? I rest my case! I made versions of the jelly shot with both vodka and gin - it works great with either. The experiments didn’t stop there. I used a gin with floral notes, and added a drop of rosewater – which was wonderful. (Important safety tip - a SINGLE drop of the highly potent rosewater will do – it is tempting to use more but trust me, this will only result in a jelly shot that tastes rather bouquet-ish!) The recipe was also tested with mint, which was quite nice! 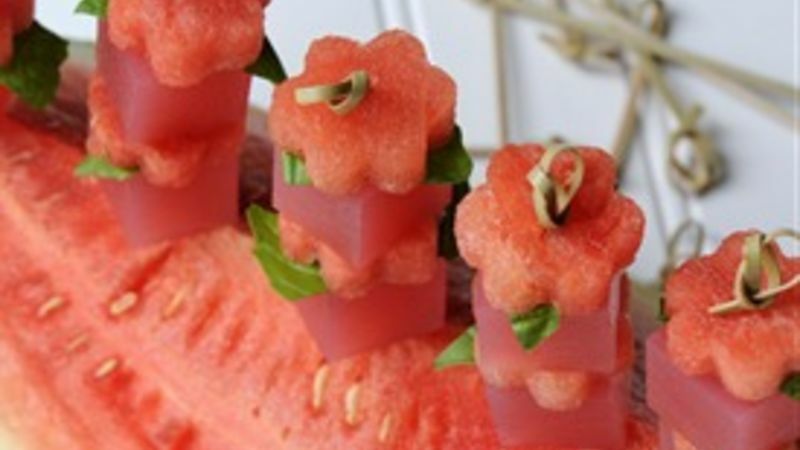 For serving, the jelly shots were cut into 3/4 inch squares and skewered with fresh watermelon (cut into flower shapes with a tiny cookie cutter), and fresh basil. However, serving options abound. The jelly shots could be cut larger and served on a round of watermelon acting as plate for the jelly shot, or served in an appetizer spoon with a little finely chopped watermelon and basil on top, salsa style. Any way you slice it, the fresh watermelon slices and basil add a nice burst of flavor.